Jeff Casterline has always been at home on the coast. Born in Port Huron, Michigan and raised in Jensen Beach, Florida, he has had one foot in the sand the majority of his life. After attending high school in Greensboro, North Carolina, Jeff earned a Bachelor’s Degree in Business Administration from the University of North Carolina at Greensboro, where he met his wife, Caryn. After earning experience in the Mortgage industry, Jeff realized his passion was in real estate. 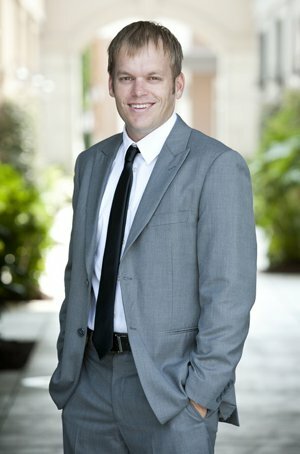 Acquiring both his North and South Carolina Real Estate Broker Licenses in 2004, he moved to Myrtle Beach. Jeff and Caryn married in Myrtle Beach in 2006, and soon after, they rescued a Boxer, Molly Wigglebutts, and are proud to say she is now very happy and healthy. The couple was then blessed with their first child in 2009, a beautiful baby girl named Riley Marie, who is truly a Daddy’s Girl. In 2011, Harrison James was born, a bouncy baby Mama’s Boy! Jeff and his family are proud Myrtle Beach Locals now, and have settled into the low country lifestyle. In the warmer moAnths, they can be found carting everything down to the beach to spend the day on the sand, and grilling out the local fare with friends. The family attends Trinity Episcopal Church in Myrtle Beach. If Jeff isn’t busy working, you can find him on the softball field, or in a local watering hole having his heart broken by one Michigan sports team or another. Jeff enjoys playing golf and attending almost any kind of live music event. He is an advocate for Carolina Boxer Rescue and the March of Dimes, participating in many fundraisers for both organizations each year. Jeff was a RE/MAX agent for five years, and proudly formed Beach Realty Group with his good friend Darren Woodard in early 2011. His primary areas of focus are high end homes and condos, land, and distressed properties. He is a licensed real estate broker in South Carolina and North Carolina, with designations including Certified Distressed Property Expert (CDPE) and Accredited Buyers Representative (ABR). With the increasingly vast inventory of properties on the market today, buying real estate in the Myrtle Beach area can be an overwhelming experience. You need an agent who is experienced and knowledgeable in working with all types of properties including foreclosures, short sales, new homes, oceanfront condos, luxury homes, and more. Jeff Casterline is that agent. Working with Jeff, clients can take advantage of Beach Realty Group’s unique Buyer’s Advantage Program which provides all the tools and resources necessary to find that perfect home, condo, or lot. Call 843-424-6900 for more information about BRG’s Buyer’s Advantage Program. Selling a property can be a challenging task in any market. In today’s economy it is even more difficult. You need an agent who will be honest with you when it comes to pricing and has the marketing in place to get the job done. Jeff has an unmatched web presence and unique marketing techniques which blend traditional methods as well as cutting edge technology based advertising. Please call 843-424-6900 or email Jeff today for a free home evaluation and for more information on his detailed and customized marketing plan. An excellent experience. While I do not ordinarily recommend service providers to friends, without reservation, I will recommend you to friends in the market to buy or sell real estate in this area. Thanks for your on going support in helping us sell our condo. Great experience from start to finish. Jeff Casterline was great to work with and made our dream come true of owning a 2nd home at the beach. Jeff was always on top of it before I got the chance to ask. It was a daunting task especially being out of state, but he made it easy. Thanks Jeff. Jeff helped us with our relocation from NJ to Myrtle Beach area. Jeff it is the BEST RELATOR we ever met. Thank you for all of your time, your kindness, your knowledge, your loyalty, professional supports!! You were wonderful to work with--we really got blessed! We appreciate your honesty and integrity!! Your strength gave us the confidence that buying home can be a pleasant experience and you know how difficult situation turn it into as pleasant an experience as possible. Thanks a million for your expertise and your big beautiful heart!! Jeff is a wonderful agent, honest and professional. He helped us find a 2nd home in M.B. We gave him a price range we wanted to be in and after several days of hunting we talked with him about raising our top limit. He encouraged us to stay with the price range we were comfortable with, and he would keep helping us look. Most agents we have worked with would have encouraged us to go higher just for the commissions, he did not. He wanted us to be happy with a purchase. After finding a property he walked us through the entire process beging to end. Even during the inspection when something went other than planned he was right on it. He always got back with us quickly and respectfully. We have recommended him to our friends and consider him a friend as well. Jeff is truly amazing. Not only did he sell our house after one showing, he also negotiated a great price on our new home and all in less than a week! He was extremely knowledgeable about the area and market and was readily available day and night to answer any questions or to make recommendations. We have already recommended Jeff to several friends and would highly recommend him to anyone else looking to buy or sell a home in the area. Thanks Jeff!!!! My wife and I always thought we would be life long renters, paying a lot of money each month toward someone else’s mortgage with nothing of value to show in the end. We only considered the possibility of becoming homeowners when we started planning for a family, and are now expecting our first child in June of 2012. The first step was to consult our close friend, Jeff Casterline with Beach Realty Group. Thanks to Jeff and his team that was informative and helpful every step of the way, we proceeded through our first home buying experience confidently, and the entire process went smoothly. Jeff was there to answer any questions we had no matter how “first time home buyer” they seemed. We appreciate his professionalism and dedication to his clients. I have always said he is once in lifetime friend, and he is truly the same kind of Realtor. Simply put, he is the best in the business. He is a true professional, with an unsurpassed knowledge of our local market and the experience to guide his clients through the process of buying a home, all with your best interest in mind. If you are looking for a home, there is no question where you should go, Jeff Casterline and Beach Realty Group will get you into a home you love, just like us. Jeff was very personable and patient with us as we bid on three different houses before finding and landing our eventual home. It seemed that all the houses we liked were out of our price range or not move in ready. On one particular morning, we had seen two other houses without much luck before Jeff surprised us by showing us a house that wasn’t even on our list. It wound up becoming our home. We had an excellent experience working with Jeff and we would highly recommend him to all our friends who are looking to buy or sell a home in the Myrtle Beach area. Jeff has the knowledge and expertise needed to sell a home quickly, in our case, one week.